You will be pleased to know that in Antigua, the hostel and guest room market is a growing segment of the accommodation market. Choose from guest rooms which are rooms to rent as part of a house, or hostels, where some bathroom facilities are usually shared. 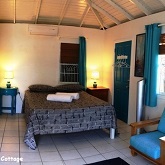 The great thing about these cheap or affordable Antigua Hostels and Antigua Guest Houses is that they are usual in the budget price range - so you can enjoy your affordable family vacation in a luxury destination.